Copy, print, scan, email, fax, internet fax. Scan-once-print-many technology and advanced scanning functions. Open architecture allows for easy integration with third-party software solutions. Maximum duty cycle up to 100,000 pages per month. Our products outperform the competition and make your workforce more efficient. An amazing array of scanning functionality like scan to email, scan to mailbox, scan to PC, scan to file server and scan to FTP or SMB, giving you the ability to electronically file, archive or distribute documents. Secure print, secure fax, encrypted data transmission and disk image overwrite protection gives you peace of mind. Scan to email, both single-sided and two-sided documents with ease. Select or search email addresses or groups from an address book or type it in. Print to mailbox to save and store jobs, then print and copy them from the device when you need them. Best-in-class media handling (16 lb. - 110 lb. stock) and smart paper trays that sense paper size and automatically match the requirements of the input. Internet fax eliminates toll calls and you don't have to worry about getting a busy signal. Scanning features allows you to distribute documents quickly to virtually anywhere in the world and save on your mailing costs. Fast page out time of less than 6 seconds, reduces wait time at the copier. 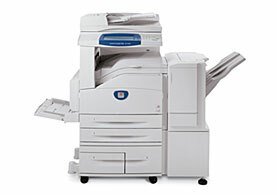 Most documents are fewer than 5 pages so how fast the first page is delivered is a key indicator of copier performance. Consumable supplies are long lasting and designed to be easily replaced by anyone and without a service call. Transparency separators enables you to place dividers between pages, and to make hard copy sets to handout, all in one easy operation. Scan speeds of up to 50 pages per minute, so you can walk away with your documents much sooner.